A ripe, pongy camembert made with 'lait cru', would be the ideal candidate for this dish. Heat the oven to 200°C/gas 6. Bring a medium-sized pan of salted water to the boil, add the beans and simmer for 3-4 minutes until they are just tender. Drain and refresh under the cold tap. To make the dressing, whisk the vinegar with the mustard and seasoning, then add the oil. Make the croutons: thinly slice the French stick, lay 18 slices on a baking sheet and cook in the oven for 5 minutes until dry and crisp (leave the oven on). Cool, then place a slice of camembert on top of each crouton. Drizzle a little olive oil over the croutons, season with pepper and scatter over the thyme. Cook the croutons for 7 minutes until the camembert begins to melt and the croutons are golden and crisp. Toss the mixed leaves with the dressing, then toss in the beans and radishes. 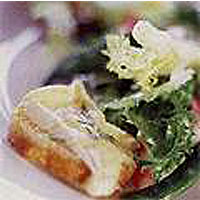 Place a small pile of salad in the centre of each plate and surround with the croutons.